Home / -Touring- / k.d. lang / Touring / Touring: k.d. 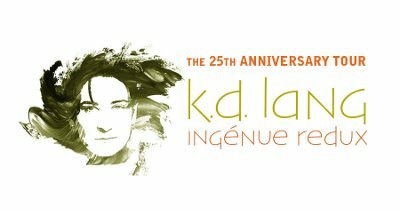 lang Bringing Her "Ingenue" 25th Anniversary to the U.S.
Touring: k.d. lang Bringing Her "Ingenue" 25th Anniversary to the U.S.
k.d. lang is bringing her 25th Anniversary Tour for the album Ingenue to the U.S. for a series of dates in late February and March. lang will perform songs from that classic album along with songs from her 2004 album Hymns From the 49th Parallel which included covers of such songs as "After the Gold Rush", "Helpless", "Bird on a Wire" and her now classic rendition of Leonard Cohen's "Hallelujah". Ingenue was lang's second purely solo album. Released in 1992, the album included the hit "Constant Craving" along with "Miss Chatelaine", "Still Thrives the Love" and "Save Me". The album peaked at 18 in the U.S., 3 in Britain and number 1 in New Zealand. It has gone on to qualify as two-times Platinum (2 million-plus sold).